Asthma and allergies often go hand-in-hand. 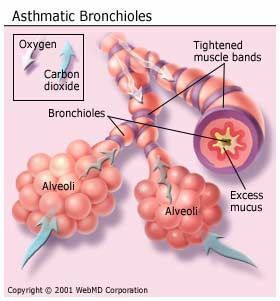 Asthma is a disease of the branches of the windpipe (bronchial tubes), which carry air in and out of the lungs. There are several different types of asthma. Allergic asthma is a type of asthma that is triggered by an allergy (for example, pollen or mold spores). According to the American Academy of Allergy, Asthma and Immunology, half of the 20 million Americans with asthma have allergic asthma. The bands of muscle that surround the airways tighten, causing them to narrow in what is called "bronchospasm." The lining of the airways becomes swollen, or inflamed. The narrowed airway makes it more difficult for air to move in and out of the lungs. As a result, people with asthma feel they cannot get enough air. All of these changes make breathing difficult. Not every person with asthma has the same symptoms in the same way. You may not have all of these asthma symptoms, or you may have different symptoms at different times. Your symptoms may also vary from one asthma episode to the next. Symptoms may be mild during one asthma episode and severe during another. Mild asthma episodes are generally more common. Usually, the airways open up within a few minutes to a few hours. Severe episodes are less common, but last longer and require immediate medical help. It is important to recognize and treat even mild symptoms to help prevent severe episodes and keep asthma in control. If you suffer from allergies and asthma, a reaction to any offending allergy-causing substance can worsen asthma symptoms. If you have any of these asthma symptoms, seek treatment as soon as possible to prevent experiencing a severe asthma attack.